If you want to see inside a room, do you peek through the keyhole or open the door? You open the door, of course, to get a full view of what’s inside. When it comes to your eye, think of your pupil as the door. When doctors need a full view of what’s inside, they open the door wide and let light in. That’s why dilated eye exams are so valuable. In this type of exam, your ophthalmologist uses medicated eye drops to make your pupils larger, allowing a much more comprehensive look inside your eyes. What we see allows us to detect and treat the diseases that rob you of sight. When do you need a dilated eye exam? If you don’t have any chronic health conditions, how often you need a dilated eye exam depends on your age. For people under age 18, we recommend dilated exams yearly. It’s crucial to diagnose and correct eye disease in youth so it doesn’t lead to lifelong complications. For example, if we don’t find amblyopia — often called “lazy eye” — by age 8 or 9, it can lead to limited vision for life. If you’re between age 18 and 60, you should have a yearly eye exam, but you may only need a dilated exam every two years. However, after age 60, your risk goes up — and so does your need. We recommend a dilated exam every year. There are exceptions to these guidelines. If you’re having symptoms of an eye disease, your doctor may want to perform a dilated exam earlier than scheduled. For example, new flashes or floaters may be a sign of a retinal issue that requires a closer look. When your eyes are dilated, your doctor is looking for signs and symptoms that may go unnoticed otherwise. Take glaucoma, for example. People call it a “silent thief” of sight because it starts with no clear symptoms. But with dilation, your doctor can search for signs of damage to your optic nerve. Diabetic retinopathy, the leading cause of blindness, is another clear example. In a dilated exam, your doctor can search for the blood vessel damage or abnormality that comes with this disease — and then seek ways to prevent it from getting worse. In addition, we look for early warning signs of cataracts and age-related macular degeneration, among other conditions. We can see some signs and symptoms through a non-dilated exam, but nothing beats a dilated exam for getting the full picture. When you make an appointment, ask if it’s time for a dilated exam. Knowing the answer will help you prepare properly. Prepare for a longer exam. It takes about 20–30 minutes for the pupils to fully dilate once we put the eye drops in. Bring sunglasses. After the exam, your eyes likely will be sensitive to light. Wearing sunglasses can help. Most offices will provide them, too. Plan for some visual effects. Many people will experience some issues with blurry up-close vision after dilation, as well. Effects such as light sensitivity and blurry vision may last anywhere from two to 12 hours, but they go away for most people within about four hours. Bring a friend or loved one if you need help getting home because of these effects. Even with these mild effects, don’t ignore the need for dilated exams. 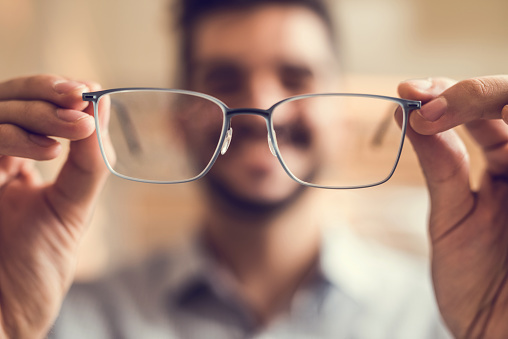 If you want to preserve your lifelong vision, your doctor needs to see the full picture inside your eye — not just a peek through the keyhole.